The eastern spotted dove (Spilopelia chinensis) belongs to the family of pigeons and doves, Columbidae under the order Columbiformes. The eastern spotted dove species are distributed in Northeast India, Bangladesh, Southeast Asia and Southeast China. These dove species have been introduced to Australia, New Zealand, USA and several southeast Asian islands. These doves are polytypic species. The eastern spotted dove (Spilopelia chinensis) is a medium-sized, somewhat long-tailed dove, measuring 27 to 30 cm in length and weighing 100 to 200 grams. The forehead, crown, lores and the area around eyes and ear-coverts of the eastern spotted dove are gray. There is a fine black line from the gape to the eye. The cheeks and the throat are pinkish brown. The lower mantle, back and upper tail-coverts are speckled grayish brown. The eastern spotted dove has a characteristic broad white spotted black half-collar, around the back and the sides of the neck. It is made of black feathers that bifurcate and have white spots at the two tips. The main flight feathers are dark gray with faint brown tinge. The central tail feathers are brown, while the outer tail feathers are dark gray. The three outermost tail feathers have white tips with gradual increase in whiter area. The breast, flanks and upper abdomen are pinkish brown. The rest of the underparts are pale pinkish brown. The legs are dull red. The bill is grayish black. The irises are reddish. The eye ring is blackish. Both the sexes look alike, but the female is slightly smaller, having a duller neck band. The juvenile eastern spotted dove do not have the neck band. In the juvenile, the irises are brownish yellow and the legs are dark gray. The eastern spotted dove species are very vocal, specially during breeding season. Their call is a loud "coo-oo...croo" or "coo...coo-oo...krook" sound. 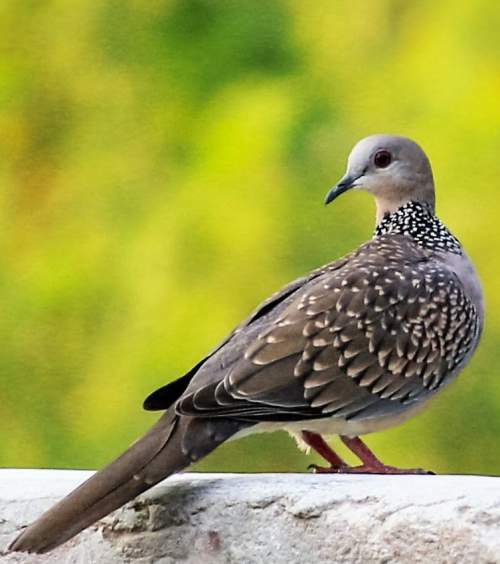 The eastern spotted dove species are distributed in Bangladesh, northeast India, Myanmar, Thailand, Cambodia, Laos, Vietnam, Malaysia, Singapore, Brunei, Indonesia, Philippines, south and eastern China and Taiwan. 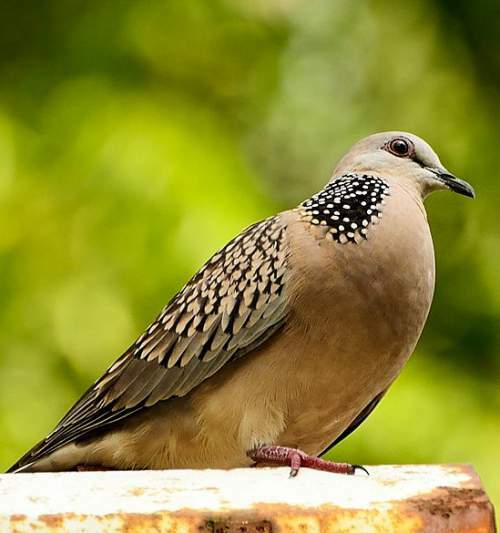 In India, these eastern spotted dove species are distributed in the states of West Bengal, Assam, Meghalaya, Arunachal Pradesh, Nagaland, Manipur, Mizoram and Tripura. The eastern spotted dove species have been introduced into many regions of the world. Feral populations have become established in Australia, New Zealand, Papua New Guinea, Fiji, New Caledonia (France), Mauritius, Maldives, Mexico, Virgin Islands (USA) and USA. The eastern spotted dove nominate subspecies S. c. chinensis is distributed in Myanmar, China (Sichuan, Yunnan, Hainan Guizhou, Hebei, Guangxi, Hunan, Shaanxi, Shanxi, Henan, Hubei, Guangdong, Fujian, Anhui, Zhejiang, Jiangsu and Shandong) and Taiwan. The eastern spotted dove subspecies S. c. tigrina is distributed in Bangladesh, northeast India, Myanmar, Thailand, Cambodia, Laos, Vietnam, Malaysia, Singapore, Brunei, Indonesia, Philippines and Timor. These eastern spotted dove species have medium forest dependence. These species normally occur in altitudes from 0 to 2400 meters. The artificial ecosystems of these dove species include cultivated lands, fallow lands, rural gardens and farmlands. The natural ecosystems of these eastern spotted dove species include subtropical and tropical dry forests, moist deciduous forests, subtropical and tropical moist lowland forests, wetlands, rivers, streams and creeks. The diet of the eastern spotted dove consists mainly of seeds of grasses. Wild seeds, buds, cereals, grains, herbs, fallen seeds, berries, fruits and scraps of human food are their primary food. These eastern spotted dove species forage on the ground in farmlands, grasslands and agricultural fields. They have been observed to occasionally reach up and strip seeds and grains from cultivated plants. They have been observed to feed on termites. The eastern spotted dove species breed primarily in spring and summer, though they have been observed to breed through out the year. Availability of sufficient food and favorable weather conditions are the main factors regulating their breeding. The nesting sites of these dove species include branches of leafy trees, bushes or shrubs, fences, telegraph poles, window-ledges, roof beams in buildings, crevices in walls, farm structures and occasionally ground. In eastern spotted dove, display flights and courtship precede mating. The displaying bird flies steeply with loud clapping of wings, to glide down to the perch with outspread wings and tail. The male makes rhythmic bobbing up and down of the head followed by bowing display. The eastern spotted dove nest is a platform of twigs, sticks, rootlets, grass and straw, sometimes lined with a few feathers. It is usually a flimsy structure with eggs visible from below. Reused nest forms a substantial structure with addition of nesting material. The eastern spotted doves are monogamous. The typical clutch contains two broad-elliptical, glossy white eggs. Both the parents incubate the eggs. The chicks hatch out after 15 days of incubation. The nestlings are altricial. The parents constantly brood the hatchling for ten days. Initially, the eastern spotted dove hatchlings are fed with regurgitated crop-milk, a secretion from the lining of the crop of parent birds. Later the nestlings are fed with regurgitated seed. The young fledge in about 15 days and become independent after 35 days. The eastern spotted dove species are mainly sedentary birds. Altitudinal movements have been observed in some populations. Post breeding, the juvenile doves may disperse and establish in new locations within the range. They may make local movements for feeding and breeding within their range. The global population size of the eastern spotted dove (Spilopelia chinensis) has not been quantified. The overall population trend of these species is reported to be increasing. Throughout its range this dove species is reported to be very common. The generation length is 4 years. Its distribution size is about 16,800,000 sq.km. Habitat degradation, hunting and the use of pesticides are the main threats that may endanger the survival of these dove species. The eastern spotted dove (Spilopelia chinensis) does not approach the thresholds for being Vulnerable, either under the range size criterion, or under the population trend criterion or under the population size criterion. The IUCN (International Union for Conservation of Nature) has categorized and evaluated the dove species and has listed it as of "Least Concern". The CITES (Convention on International Trade in Endangered Species of Wild Fauna and Flora) status is ‘Not Evaluated’ for eastern spotted dove (Spilopelia chinensis). The eastern spotted dove (Spilopelia chinensis) was earlier included in the genus Streptopelia. Spilopelia chinensis is closely related to the western spotted Dove (Spilopelia suratensis) and the laughing dove (Spilopelia senegalensis). The two recognized subspecies of eastern spotted dove (Spilopelia chinensis) are: Spilopelia chinensis chinensis (Scopoli, 1786) and Spilopelia chinensis tigrina (Temminck, 1810). 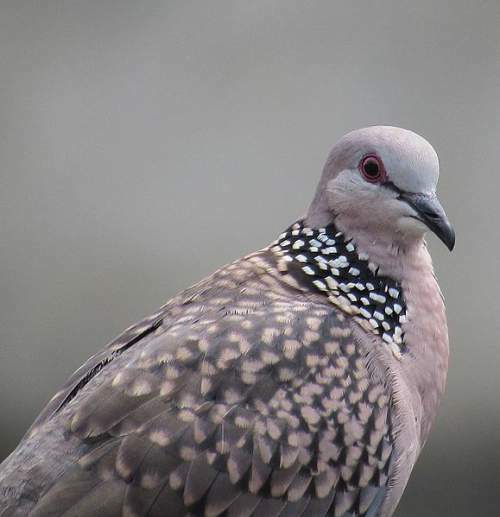 Current topic in Birds of India: Eastern spotted dove - Spilopelia chinensis.